Whether you use your waterfront for swimming, boating, entertaining, or viewing—Waterfront Restoration provides you summer long peace of mind via the most thorough SCUBA deep cleaning results in the lake weed removal industry. We are referred for a reason. With 15 years of experience, hundreds upon hundreds of delighted clients, and on nearly every metro lake, we are truly honored to have earned such trust. If you have never used our service before, we are very grateful for the opportunity to work with you, and are happy to provide testimonials from neighbors nearby you for you to speak with. 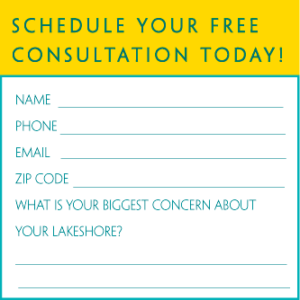 Our by-the-root removal service are backed by our Love Your Lakefront Guarantee. If the results up to one week after any visit weren’t to your satisfaction, we’ll work with you to ensure it’s done right. We are confident in our results and stand fully behind our work.